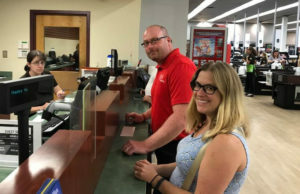 EGTA President Drew Romanowski and EGTA Vice President Alison Hosier make a donation to the American Red Cross at Price Chopper in East Greenbush. The East Greenbush Teachers’ Association donated $1,300 to the American Red Cross for hurricane victim relief last week. The donation was made to the Price Chopper in East Greenbush because the Golub Foundation will match the amount for a total donation of $2,600. Annually, the teachers’ union directly supports community organizations with funding that exceeds $10,000, including both a two-year and four-year scholarship for graduating seniors who wish to become teachers. Last winter, teachers donated $2,200 to help a local family in need. They also give to their annual CONSERNS-U food drive in November and Columbia’s free clothing shop, the Basement Boutique, in December.